A compound called betanin found in beets Beta vulgaris, a common garden vegetable may be able to treat Alzheimer’s disease. The study published by the American Chemical Society was presented at the 255th National Meeting & Exposition of the American Chemical Society (ACS) on March 20, 2018 in New Orleans, Louisiana. Betanin Stopped Oxidation of Neurons in the Brain by 90%. Previous research had shown that beets might be able to treat Alzheimer’s. Following those earlier leads, the researchers at the University of South Florida discovered that it is betanin, the compound that gives beets their glorious red color that is used as a natural food coloring and in commercial dyes, that can help treat Alzheimer’s disease. Betanin has been shown to have properties that can stop one of the bad effects of Alzheimer’s, which is abnormal folding and clumping of proteins found in the brain that leads to the oxidation and death of neurons. Betanin was able to stop the oxidation of neurons by 90%. The researchers hope that this will pave the way for new drugs to be developed that can stop the progressive cognitive decline in seniors with Alzheimer’s. Alzheimer’s is an incurable fatal disease that causes progressive memory loss, decline in cognitive function, personality changes and psychiatric symptoms. No one knows for certain the exact cause, but it appears to be a combination of aging, genetic factors and lifestyle. For instance, a recent French study has shown that drinking hard alcoholic beverages leads to all dementias including Alzheimer’s. Aging is definitely also a factor, as the risk for contracting Alzheimer’s increases with age. According to the Centers for Disease Control and Prevention (CDC) about 5.4 million Americans have Alzheimer’s disease which is the sixth main cause of death in all adults and the fifth leading cause of death in those over 65. 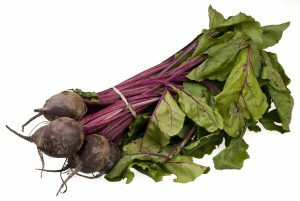 Beets are a nutritious root vegetable found in many different cuisines, most notably the Russians, who are famous for their beet borscht. Beetroots have some good vitamins and minerals like iron and calcium. However, beets and beet greens also contain a substance called oxaluric acid (oxalate) which actually keeps the body from absorbing some of these minerals, especially calcium and iron. This can lead to hypocalcemia (low blood levels of calcium), kidney damage and the formation of kidney stones. Seniors who have kidney problems or have had a history of kidney stones should not eat a large amount of beets and should consult with their doctors about the advisability of eating foods like beets that are high in oxalates. In animal tests, beets were found to keep fat from being deposited in the liver and thus beets may be able to prevent fatty liver disease (PDR of Herbal Medicine, 2004). Alzheimer’s is such a terrible disease that makes for such poor quality of life, not only for the afflicted senior, but also for their family members, especially when there are personality changes. It is to be hoped that the common beet might hold the key to stopping the downhill progress of this very disabling disease.